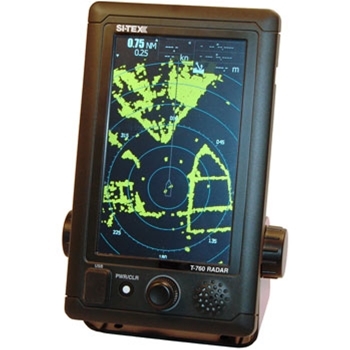 The Sitex T760 Radar breaks the mold for standalone radars. This 4kw digital radar provides range up to 24nm, has built in MARPA and is all displayed on a 7” color touch screen display. The newest member of the Si-Tex Marine Electronics radar family takes single station radar performance to a completely different level. The T-760 integrates new features such as a touch screen user interface, 50 target AIS tracking and 10 MARPA targets. Measuring in at a little less than 5.4” wide by 8.9” high and 3.5” deep with a 7” color LCD display, the T-760 is compact enough to fit the needs of most users regardless if you’re sailing, cruising or fishing. While small in size, this 4KW radar has a range of up to 24NM along with multispeed rotation.The series includes the T-760, equipped with an 18-inch compact radome antenna for rock-solid performance in a wide range of conditions and range scale choices from 1/8th nm to 24nm. Among many other notable standard features of the T-760 Series are Relative Motion, True Motion, North-Up, Head-Up and Course-Up presentation modes, Auto or Manual Sea/Rain Clutter modes. Control of all these features is achieved via the T-760’s touch screen LCD display and rotary dial, for a simple and intuitive menu interface. 7" Color Touch Screen LCD Display. Range Scale; 1/8th nm to 24 nm. Intuitive Touch Screen/Rotary Dial Control. Ideal for Most Vessels Regardless, Power or Sail. Compact Radar Dome with 4kW Output Power. 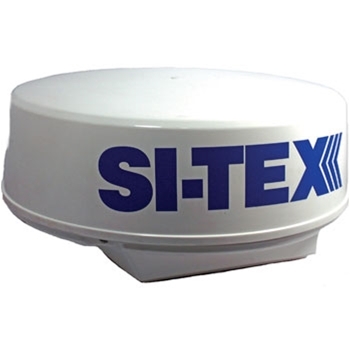 The Sitex T761 Radar has a 24" 4kw digital radar dome that provides a whopping 48nm range. With built-in MARPA, AIS and a color touch screen display. You will get all you need and more with the T761. Top Quality 4kw Radar with a 25" dome antenna and a large 8.4" color display. The T-941 features Si-Tex’s new Hyper-Digital Processing (HDP) for real-time presentation and target discrimination.